As an experienced educator, endorsed nurse practitioner and an exceptional nurse academic, Dr. Jane Frost is one of the most impressive speakers on our line-up for TEDxCanberra Momentum. We were lucky enough to spend five minutes with Dr. Jane to talk about her extensive clinical career and her strong passion for improving patient care. Here is what she had to say. Q; Tell us a bit about your work and why you love it. I am a nurse practitioner, nurse educator and nurse academic. I am passionate about teaching the nurses of the future to care about patients. I want my students to understand the importance of putting together the art and science of nursing. to learn that communication is such a powerful tool and that kindness and compassion are the things that distinguish a good nurse from a great one. I am passionate about nursing roles and the difference nurses can make to patients lives. I am an innovative educator who tries to make learning engaging and relevant. My research into patient enablement, relates to giving patients the ability to cope, manage and understand their illness so they can make informed decisions that are right for them. Nursing is about people, it is about noticing, and responding to people and recognizing that everyone is different. Q: What’s something you are working on right now that you can share with us? I am currently working on ways to use Virtual Reality and Augmented Reality technology to create immersive teaching environments in health. Q: What does MOMENTUM, our TEDxCanberra2017 theme, mean to you? Momentum to find new ways to teach communication, compassion and kindness in a digital age. The value of communication, kindness, compassion and empathy. Q: What do you like most about Canberra? It is a wonderful place to bring up a family. Q: Fun Fact. What’s one thing you can share that people don’t know about you? Don’t miss out on Dr. Jane Frost’s incredible talk this September 16 at the Canberra Theatre. Professor Susan Scott is a Professor of Theoretical Physics in the Research School of Physics and Engineering at the ANU, and one of the exciting speakers lined up for TEDxCanberra Momentum. Her love of science, exceptional research expertise, and deep passion for women’s participation in science and policy making is not only inspiring but critical in determining the future health of our planet. We sat down with Professor Susan for a quick chat. Here is what she has to say. Q: Tell us a bit about your work and why you love it. I am a mathematical physicist. I love trying to understand how the laws of physics work and how they apply to every aspect of our Universe … I am inspired by the big questions which we are still on a quest to answer – what is dark matter, what is dark energy, are we alone, how did the Universe begin? So currently we are absorbed with trying to probe how gravitational waves which may be detected from neutron stars in the future will enable us to unlock the mysteries of the physics of neutron stars, the densest objects in the Universe. MOMENTUM is central to my talk as the black holes in a binary system of two large black holes have a massive amount of momentum as they get closer and closer together in a cataclysmic death spiral whizzing around each other at half the speed of light! They will hear about the 100-year quest to directly detect gravitational waves here on Earth… [and] learn of the mysterious nature of the event which caused the gravitational waves that were measured in the first detection in 2015, involving objects which are so exotic that they cannot be detected by any other means. Q: What are you most looking forward to sharing at the event? I am most looking forward to sharing the excitement of my journey of scientific discovery with the audience. I am also really looking forward to taking in all the other talks and entertainment at the TEDxCanberra day. I love the fact that Canberra is not too big and it’s not too small. It has all the facilities of a larger city but the feel and community spirit of a country town. The open spaces throughout Canberra and the wild places nearby make it a very attractive place to live. I am passionate about wilderness. I love to experience it as often as I can and I am keen to assist in its preservation while we still have a window of opportunity. See Professor Susan Scott join our incredible speaker line up on 16 September at Momentum. Tickets still available here. Tell us a bit about your work and why you love it. I work as a leader in Disability Employment Services. I get to work with an incredible team of people who are deeply committed and invested in people with disabilities. Through accessing all that the community has to offer, and by experiencing both success and failure, people with disabilities are able to live the life they choose and become the greatest version of themselves. What’s something you are working on right now that you can share with us? I’m currently working as a member of the Chief Minister’s LGBTIQ advisory council and as a member of the ACT government disability reference group. I am also actively campaigning to ensure that people vote “Yes” for marriage equality in Australia. What does MOMENTUM, our TEDxCanberra2017 theme, mean to you? Momentum means many different things to me. I’m especially interested in how my momentum reflects and influences others in our diverse communities. Momentum has the potential to transform people’s lives in so many different ways. What can our TEDxCanberra audience expect to hear from you? Audience members can expect to see momentum like they’ve never seen it before! Using humour, wit and charm, I will challenge the audience members to think about the social labels we commonly use and the impact that they can have on people’s lives. I will also show the audience that I am not afraid to laugh at myself. What are you most looking forward to sharing at the event? I’m most looking forward to sharing the day with the other speakers and having the opportunity to engage with as many audience members as possible. I want to share my unique insights and perspectives to challenge the way people think and feel about people like me. What do you like most about Canberra? I like that Canberra is a vibrant, growing, ever-changing and inclusive city. I’m also a huge fan, of the now world-famous, “freak shakes” and would love one day to have one named after me. Fun Fact. What’s one thing you can share that people don’t know about you? I love art and have many pieces in my house, including a very large self-portrait. Not long now until you’ll get to see Wayne perform at TEDxCanberra2017 – Don’t forget to get your tickets. Dr Lynore Geia has an undeniable passion for Indigenous health, for building family strength and for Indigenous led community development. When she’s not teaching midwifery students on best practice care for Aboriginal and Torres Strait Islander women and their families, she’s busy leading a research study on psychosocial issues that affect them while teaching them the methodology to conduct their own research in the future. We’re thrilled to have Lynore join as a speaker at TEDxCanberra Momentum on Saturday 16 September at The Canberra Theatre. I work in tropical north Queensland as a university academic and my work involves providing leadership in Aboriginal and Torres Strait Islander health issues, including teaching and learning, research and community engagement. The tropics have a dynamic urban, regional, rural and remote Aboriginal and Torres Strait Islander community that brings a rich learning experience to health students and staff. My home community is a discrete Aboriginal community that has survived the decades of punitive past practices of government control of Aboriginal and Torres Strait people. Now, communities are rebuilding and exerting political and social agency – it is an exciting time and a challenging one. Our communities have a young demographic population compared to the rest of Australia and this is where my job intersects with the community and university. I love working in this space because I can bring community and university work together which benefits both parties. I love working with youth and young people in my health profession and in the community setting. My work provides a great opportunity to break down barriers, and build bridges in areas that keep Aboriginal and Torres Strait Islander people and wider Australian people apart. My aspiration is to see more Aboriginal and Torres Strait Islander people succeeding at university and working in the health profession. I am currently teaching undergraduate and postgraduate midwifery students on midwifery care of Aboriginal and Torres Strait Islander women and their families. This is an important subject because it provides students with the knowledge and skills to engage in culturally safe maternal and child care in the hospital and community setting. I am also leading a research study within my own community, working with youth 14 – 24-year old’s on psychosocial issues that impact on their lives, the aim is to build a locally driven strategy to address some of these identified issues. This is a first for the community and we have been building research capacity in the young people so that in the future they can conduct their own research in partnerships with others. The word momentum brings up many images in my mind, but the most outstanding two is timing and moving forward. I believe that there is always a right time to do things and when you step into the right time it brings with it its own rewards. With the current national political and social developments in Aboriginal and Torres Strait Islander affairs, the MOMENTUM theme provides a timely space to talk about these issues to a wider audience of people and provide insight, understanding, and it challenges us to move forward to build together. Some information about my life, Indigenous leadership, and aspirations as First Nations people. I look forward to sharing some of my future hopes and vision for Aboriginal and Torres Strait Islander people. Canberra is the seat of representation for all things political and social that impacts all our lives. I like Canberra because everytime I come here I think about the giants of Aboriginal and Torres Strait Islander leaders whose shoulders I stand on and step out to follow their footprints towards building the momentum to our future. I like to think about myself as an Espresso shot – short, black and can pack a punch – despite the seriousness of our lives I aspire to have a good sense of humor. Purchase your tickets for September 2017’s TEDxCanberra Momentum today. Local Canberran Kate Seselja currently works as an advocate to the United Nations Association of Australia, has founded her own not for profit, and is a sought-after professional speaker and mentor. With a resume dotted in impressive achievements, it’s easy to forget that Kate hasn’t always been the successful and brave role model she is today. Accumulating more than $500,000 in debt from pokies, the mother of 6 struggled with a gambling addiction for more than a decade before she hit rock bottom. Turning her life around with self-determination, counseling and rebuilding her family relationships, Kate is now an advocate for helping gamblers battling addiction – and aiding in prevention so it never gets that far. Here’s a sneak peek of what you can expect to hear from Kate at TEDxCanberra Momentum on Saturday 16th of September. I love everything about what I do and the change it is making. I love that the constructive use of my own story has helped people to connect effectively with their own journey and restore hope. I’m involved in various consulting roles in advocacy for gambling reform as well as practical workshops across all sectors – pain is universal. I currently have a new website in development which I’m really excited about. It’s about moving forward and progressing together as a collective. A fresh perspective on a topic that impacts us all – yet most will never discuss. Tickets for Momentum are now on sale, limited tickets are available – book now. Have you ever stopped to listen to other worlds around you? Not the hustle and bustle of your everyday, but the rich ecosystems and places like the cloud forest of Papua New Guinea or the grasslands of the Kimberley. Andrew will be inviting us to explore places such as these and highlight the importance of appreciating the worlds we cannot see. I make and publish recordings of natural soundscapes. As an art form, where I place my microphones dictates the outcome. I enjoy the process of thinking about the optimal location, reading the landscape and anticipating the behaviour of wildlife. I also supplement the audio with photographs and words to give listeners a sense of what they’re hearing, and the significance of it. 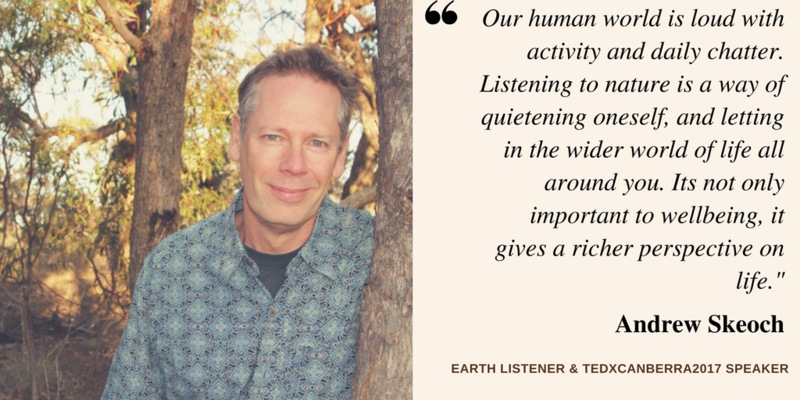 I believe that listening can connect us personally with the living presence of the natural world. Hence it is a powerful way of communicating the values of conservation. I have just returned from 5 weeks in the Kimberley region of northern Australia, recording in a variety of habitats from savannah grasslands to rocky gorges and wetlands. Next up is an expedition to the rainforests of Papua New Guinea. I’ll be in remote areas, requiring us to take all our food and supplies in for the duration, and working with local guides. In social terms, when a quantity of people think and act in a particular way, the momentum of the outcome becomes unstoppable. It is culture, ideas and beliefs that can change the impact we have on each other and nature. Through making sound recordings of wild places that people do not normally have access to, I am hoping to inspire listeners to be aware and appreciate these environments and the creatures that live in them. It is my small way of contributing to the growing momentum toward changing the way we view ourselves, affirming the understanding that we are one species among many, living on this wondrous and fragile world. I’ll be encouraging the audience to listen to the natural world more deeply. In sharing how I hear it, and what I’ve learned, I’ll be giving insights into developing listening skills, what to listen for, and how to think about what we’re hearing. The audio recordings of birds and animals. They are what audiences enjoy and emotionally respond to. There is so much nature in the city. It really is a model of how to build a human environment that makes space for other creatures to live too. Fun Fact! What’s one thing you can share that people don’t know about you? I grew up in the middle of Sydney, in a family with little interest in nature. I had no teachers or mentors who encouraged me when I was young. My mother was puzzled by my childhood enjoyment of bushwalking and birdwatching, and wondered where it came from. She’d often quip that “one look over the back fence was enough for her”. Be sure to join Andrew and his recordings at Momentum on Saturday 16 September at The Canberra Theatre. Although self proclaimed research nerd Dr. Kal Ientile enjoys creating momentum by throwing himself out a perfectly good plane, there may be more to the conversation than meets the eye. Here’s a sneak peek into what makes this Acupuncturist get excited about movement. When people come to me after being told ‘You’ll just have to live with it’ or ‘we can’t find anything wrong’, I love being able to turn that around and make a real difference in their lives. To help someone who is losing hope is an amazing feeling. Because acupuncture works stimulates the body’s own healing mechanisms, we can work with a very wide range of health concerns, and get people back to doing the things they love in life. I work with a number of partially paralyzed patients following strokes and acquired brain injuries. The return to being able to grab a glass or walk up stairs is so important for self reliance and self esteem. We’re supposed to move. Our bodies need movement to maintain health. I am enjoying watching that idea gain momentum. Our bad habits can shape us over time, but so too can our good habits. How welcoming the Canberra community is. I’ll happily throw myself out of a perfectly functional plane. To find out more about Kal and ‘Spoon’ be sure to join us at Momentum on Saturday 16 September at The Canberra Theatre. Gamification is part of our everyday life whether we realise it or not. 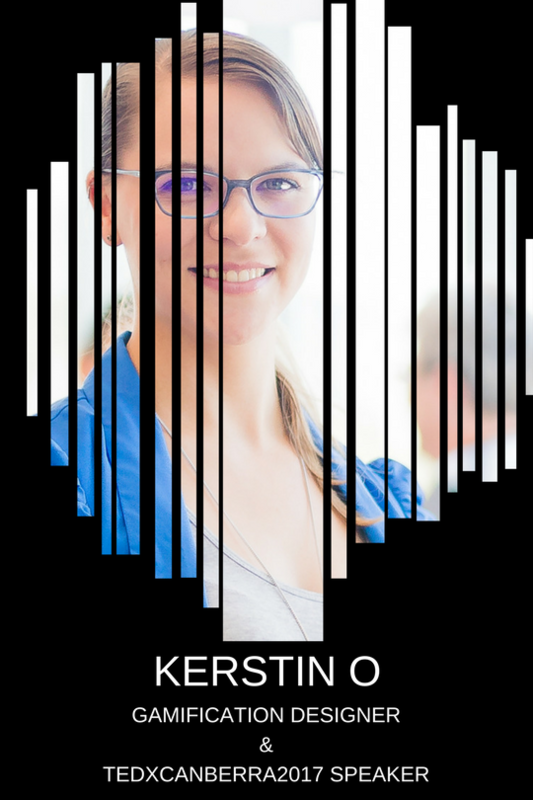 But instead of seeing it as a way to coerce, Kerstin shares with us how we can apply fun and games to improve our work and life. I work as a gamification and design thinking consultant, and am doing my PhD in gamification. Gamification is about bringing play into our lives to achieve great things together. I love gamification because it helps us nudge behaviour to be healthier, work better together, achieve goals, all while having more fun! I’m working with several teams to apply gamification in their workplaces. We are working on how to share knowledge, collaborate, and celebrating collective achievement. It’s very exciting to be part of transforming teams through the power of fun. Momentum is about being active in creating the future we want. It’s about bringing people together to work toward something. It’s about energy and future. 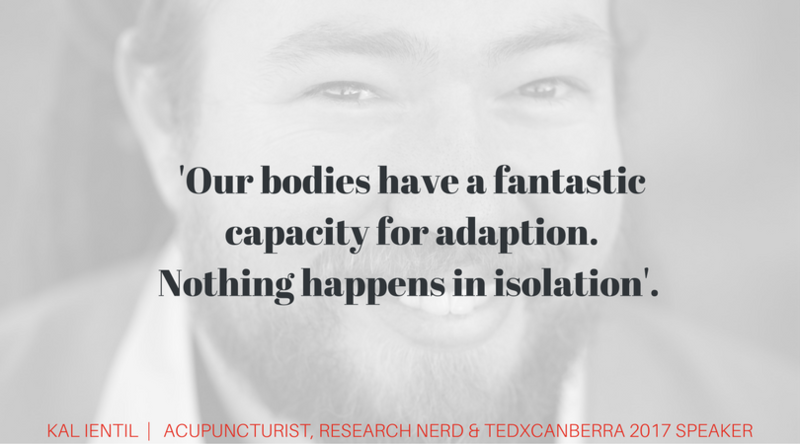 Q: What can our TEDxCanberra audience expect to hear from you? I’m going to talk about how gamification can be used to help us work together towards collective goals, and change the way you think about games and play. 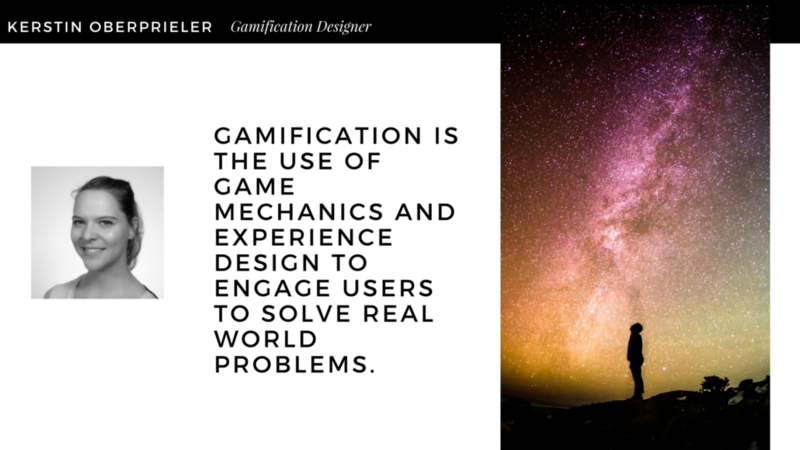 You’ll leave excited excited about the potential of gamification. I want to share my passion for gamification, and show people how we can meaningfully integrate fun and play into more aspects of our lives. I love Canberra’s people, the blending of nature and city, and how proud we are to live here. I’m a black belt in 3 martial arts, and am studying 2 more! To find out how gamification can enhance your work and play, join us at Momentum on Saturday 16 September at The Canberra Theatre. Darren Bradley is an award-winning photographer who utilizes his passion for Modernist architecture to portray Canberra in a nostalgic and striking light. 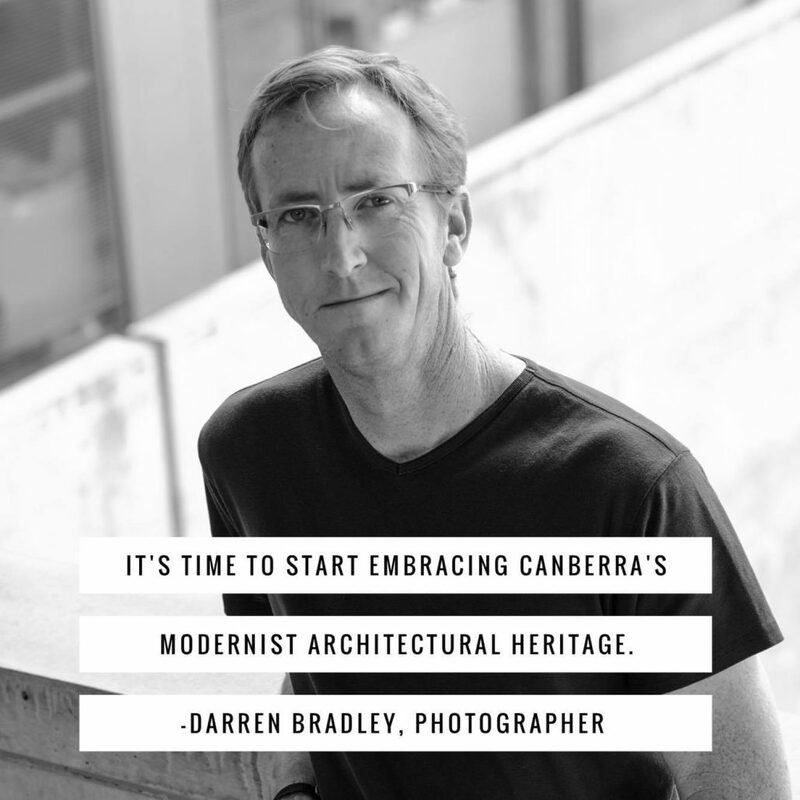 Speaking at TEDxCanberra Momentum on Saturday 16 September, Darren will explore Canberra’s untapped Modernist architectural heritage and share his most inspired photos of the nation’s capital. We were lucky enough to have a quick chat with photographer extraordinaire. Here’s what he has to say. I love architecture, and my work allows me to connect with our built environment in a unique way. …Most people live, work, and pass by these buildings every day without a second thought. My hope is that my photography will enable people to stop and notice – and maybe even appreciate – their surroundings. I am currently working on a travel guide for mid-century modern architecture on the east coast of the USA. The first volume of the series, on the west coast, came out last year. Canberra has so much untapped creative potential and energy. So for me, it’s about tapping into that energy to foster the city’s innovative spirit – and also build recognition and appreciation for what we have here. Canberra’s Modernist architectural heritage is unique – not only in Australia but throughout the world. The city was built at a unique time in history when optimism for our future was the dominating design principle. Canberra was meant to demonstrate to the world that Australia was a modern country – and the architecture here represented this young country’s willingness to embrace progressive ideals. This Modernist heritage creates a sense of place and identity that should be embraced and preserved, because it’s the soul of the city. It also makes financial sense, as people increasingly crave authenticity in their built environments, and architectural tourism is on the rise. The people, who are highly educated and also very open to the world and new ideas. I also love the unique built environment and its Modernist character, of course. Architectural photography is not my primary occupation. I’m also a director at a large, multi-national aerospace and defence company. Don’t miss Darren’s talk this September 16 at the Canberra Theatre. Buy your tickets now here! Being passionate, living with purpose and finding your true self is an extremely hard task, let alone making them all work in harmony. Grace has conquered her goals as she found her true calling as a photographer, coupled with her love for animals. I tell stories through photography. I’m a photographer both commercially and as a photographic artist. Photography continues to surprise me and challenge me. I think i’m addicted to the magic that’s created from photographic images. Q. Has there been a moment that has shaped you as an artist? I’m usually crafting my work through portraiture of people, now I’ve moved on to telling stories about horses through my conceptual photography. It’s where my artistic photographic career has led me since the successful launch of HORSE, and it is the most challenging work I’ve ever done but also the most rewarding because it comes from my heart. Horses are what I am willing to work hard for, what I am willing to go to extreme lengths for and I have so many crazy ideas that I can’t wait to bring to life! 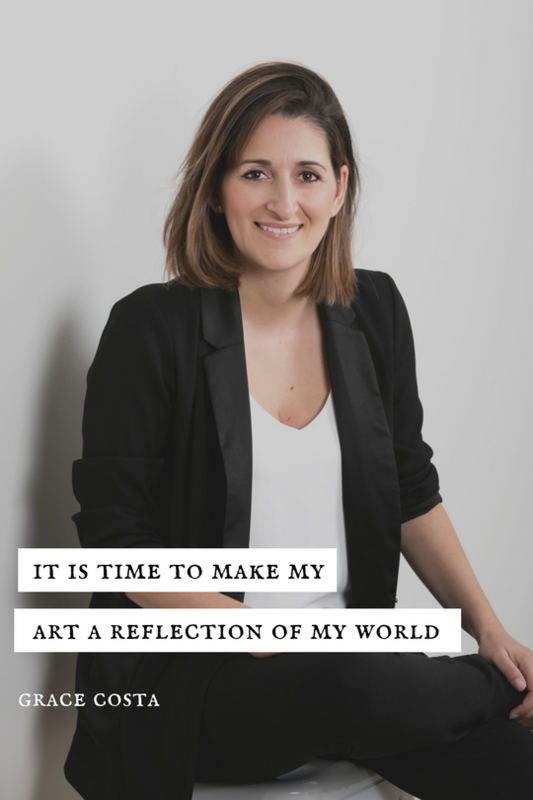 My work and visual interpretations connects me to my purpose and I know that my talk will allow the audience to connect to who they truly are as I have done so with my art. Q. What are you working on right now that you can share with us? My next horse series is underway and I just want to continue to share my imagination with the world. I have found my purpose as an artist and I’m so energised to start the next series! Q. 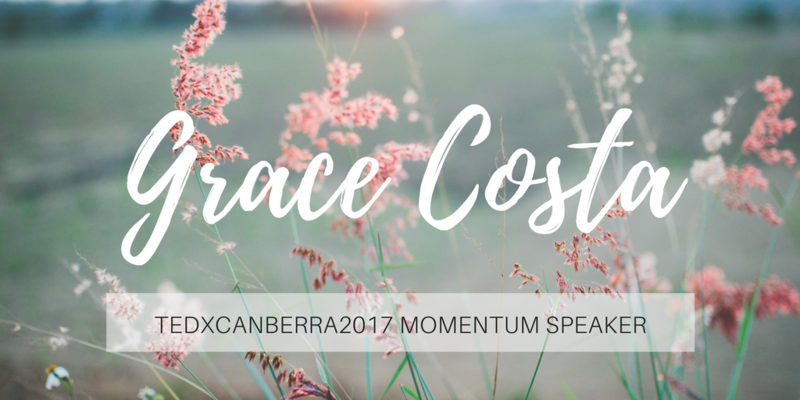 What does MOMENTUM, our TEDxCanberra2017 theme, mean to you? It means the flow from one thing to the next, flowing through doubtful and challenging times in your life or career and coming out the other side feeling on top of the world. Riding the momentum is part of the journey to discovery. Q. What can our TEDxCanberra audience expect to hear from you? I’m so excited to share stories about my journey and discovering what horses have taught me and how I made my personal story come to life. The audience can expect a true story full of passion, finding your purpose and being set free by connecting to who you truly are. Q. What are you most looking forward to sharing at the event? Sharing my story to inspire others to follow their ideas and to tell their own story. Q. What do you like most about Canberra? I was born here, so I love seeing the city evolve into a much cooler place than it was when I was young. What I love most is the large areas of bushland throughout Canberra. Perfect for keeping horses and going on long trail rides. The most famous person I’ve photographed is Her Majesty the Queen in her official visit to the Royal Military College Duntroon in 2011. Don’t miss out on your TedXCanberra2017 Tickets, themed Momentum. Get them here before they all sell out!